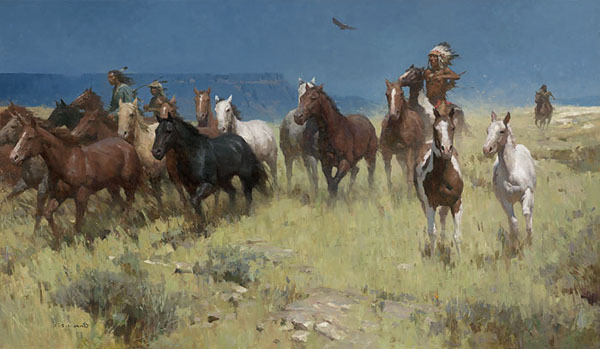 Once introduced, the horse quickly became central to Great Plains Indians’ life. They were a measure of wealth and, interestingly, an individual’s prestige was judged not so much by how many horses he could accumulate, but by the number of horses he could give away. Horses served as universal currency and horse stealing was part of the marking of time. (Crazy Horse, the Oglala Lakota, was born "in the fall of the year in which the band to which he belonged, the Oglala, stole One Hundred Horses.” Crow Dog, another Lakota subchief, was born at Horse Stealing Creek in what was then referred to as Montana Territory.) Horse stealing was a rite of passage. A boy on his first war party was given a juvenile nickname, but after he had stolen his first horse or killed an enemy, he was given a distinguished name.